From 6:00 am through 6:00 pm, Sherri Lynne’s Towing can be reached at 502-883-8284. We are NOT a 24/7 company, don’t try to be, don’t want to be; we’ll leave that to the strictly commercial and larger operations. HOWEVER, if you are with your vehicle, broken down on an Interstate at night, or in extremely hot (above 90 degrees) or cold (below 40 degrees) weather or with small children in the vehicle. CALL AT ANY TIME, DAY OR NIGHT, we will either come get you and your vehicle to safety ASAP; or try to provide you with the phone numbers of other companies who are able to respond ASAP. 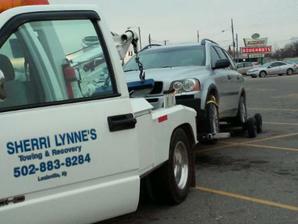 TOWING: The best way to contact us by telephone if you wish to obtain a tow; at 502-883-8284. VEHICLE IMPOUND: If you are a property owner or manager wishing to have a vehicle impounded and towed away ASAP, you may call 502-883-8284 to exchange necessary information. PROPERTY OWNERS AND MANAGERS may also contact us through e-mail at: abjflouisville@gmail.com the e-mail account is usually checked early in the mornings and late at night daily for initial contacts. Please include a your name, call-back number, hours you will probably be available to receive a phone call and any other information you consider of consequence. VEHICLE RELEASES: If you are attempting to confirm that Sherri Lynne’s is the company which impounded and towed your vehicle from private property, call the phone number given above: 502-883-8284. We will be glad to provide you with any required information to facilitate reuniting you with your vehicle.